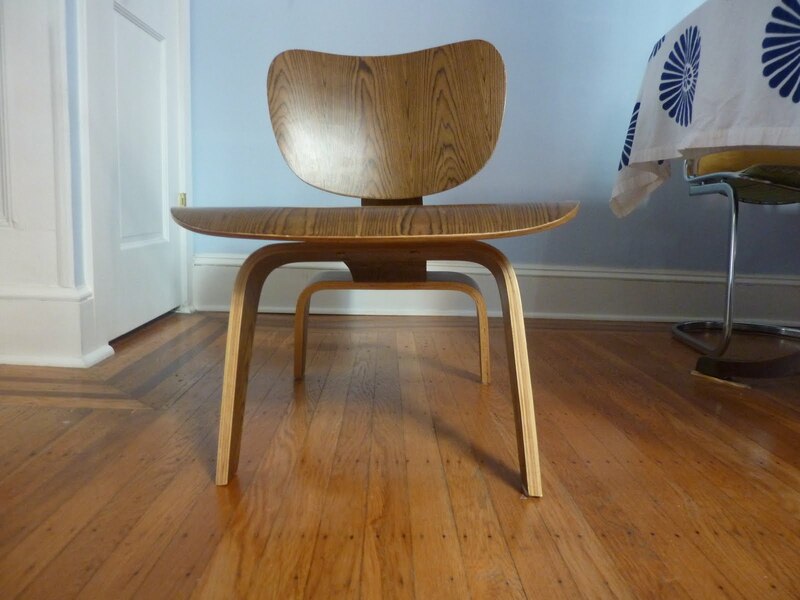 I recently found an Eames Molded Plywood Lounge Chair, on trash day abandoned on the side of the road. I drove by it, saw it, and called Scott who was still at home and asked him to pick it up ASAP. 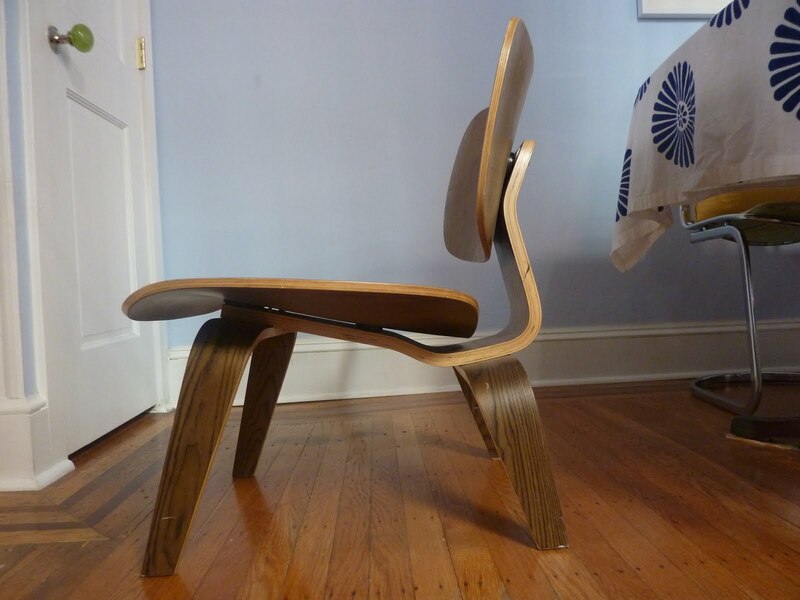 After I hung up the phone with Scott I realized that he was not the slightest bit moved by my shrieking over the phone that it was an original Eames chair! I decided that if I wanted that chair I would have to drive back, around the block, in the middle of rush hour, and get the chair (we live on a one way street in a maze of one way streets) . As I jumped out of the car, and ran towards the trash I couldn’t believe my luck at finding this chair. When I got close to it I realized that it was in amazing condition. The back piece was not attached to the back rest but it could easily be fixed. With my heart pounding in my chest I picked up the chair and ran towards our house and dropped off the chair in Scott’s arms. All this time (which felt like an eternity) I was double parked on our street, and there were a string of cars all honking their horns at me. Finding this chair made my whole month! We were visiting my father-in-law recently when he mentioned that he saw a huge mirror on the side of the road. Within seconds of him mentioning this we were both in his truck driving towards the neighborhood where he thought he saw the mirror. We found the mirror and it was in great condition. It is HUGE. 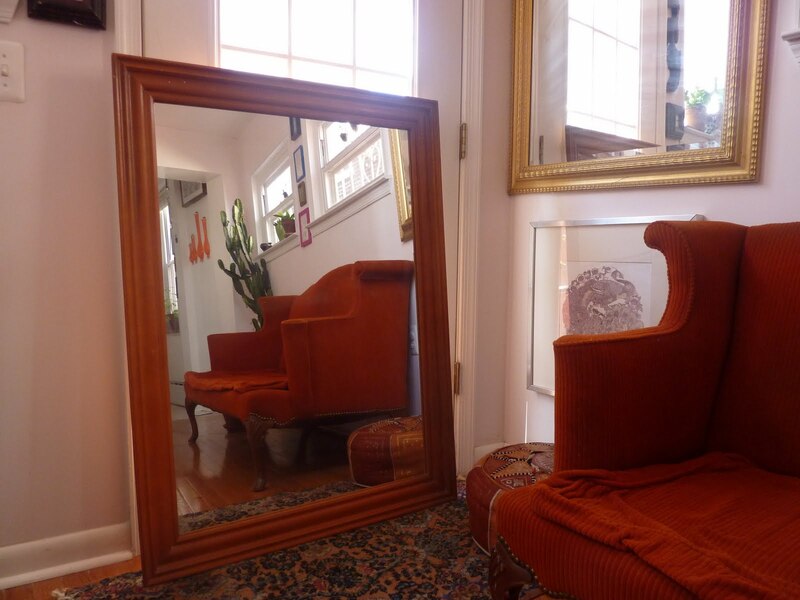 I can’t believe that someone would want to get rid of this fabulous mirror. All it needs is a couple of coats of oil paint. My favorite oil paint is Hollandlac by Fine Paints of Europe because it makes everything look amazing. In case you are wondering the vintage settee was a gift from Scott. I am currently obsessing over the right fabric and I plan on getting it re-upholstered (professionally) soon.